The ginger in my pantry has started to sprout, so I guess it's finally time to plant some ginger in the garden. I mean, if this rhizome is this determined to grow, it deserves to be planted. Ginger is one of my favorite flavors. I love it in Thai vegetable soup, with stir fry vegetables, in carrot juice, and my guilty pleasure is my husband's homemade ginger ice cream. Ginger is something we always have in the pantry since it keeps well when stored in a dry place. The health benefits of ginger have been well-studied and include soothing gastrointestinal distress (nausea and gas), boosting immunity, relieving motion sickness and morning sickness, reducing inflammation and fighting cancer. Being a person who lives with chronic joint and muscle pain, I feel that controlling the inflammation in my system helps me manage my pain. Anti-inflammatory medications upset my sensitive stomach, so I choose the natural route to wellness. I prefer delicious ginger over a pill any day. Ginger tea is my favorite go-to remedy for an upset stomach. Simply peel and slice some ginger and steep it in hot water for a few minutes, add a squeeze of fresh lemon juice if you want. There you have it, stomach relief the natural way. This is my first time planting ginger in the garden, and although early spring is the ideal time to plant it, my nurseryman said it's fine to plant it now in my Los Angeles area garden. I figured it's worth a try since my rhizome is already sprouting, so I did some research and this is what I have learned about growing ginger. It grows in tropical zones (USDA Hardiness Zones 7 and higher). In cooler climates it can be grown indoors. You can purchase ginger root in the grocery store. Technically it is not a ginger root that we eat, but rather a rhizome. People refer to it as ginger root, and I'll use both terms. Look for plump roots with multiple "fingers". If there are green tips at the end of the fingers, that is good because those are the growth buds. To plant the root, choose a sheltered area. Dappled sunlight is ideal, or plant in partial shade. The plants are sensitive to frost and wind so I chose an area next to a covered brick patio where it will be tucked behind a rose bush and underneath our tangelo tree. Ginger was planted where you can see the blue tape covering the hose end toward the left. My dog approves, Sweet Bessie May. This is the bed where I recently transplanted some strawberries. Read about transplanting strawberries here. 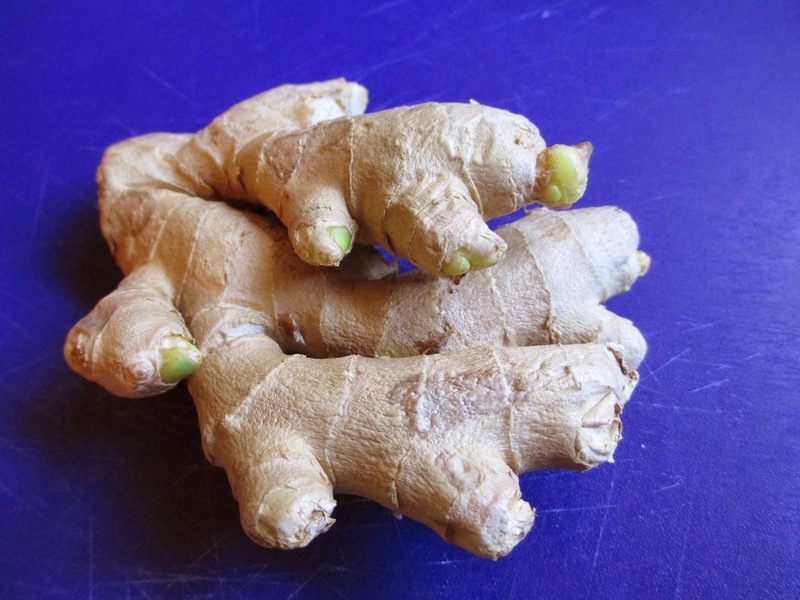 Ginger prefers rich, light and well-drained soil. It prefers to be evenly moist, and likes humidity. This bed was basically sand, so I added plenty of organic compost. The soil ended up being one part sand and one part compost. This organic compost had chicken manure added so hopefully it will be rich enough. I will continue to mulch the area with homemade compost as needed. 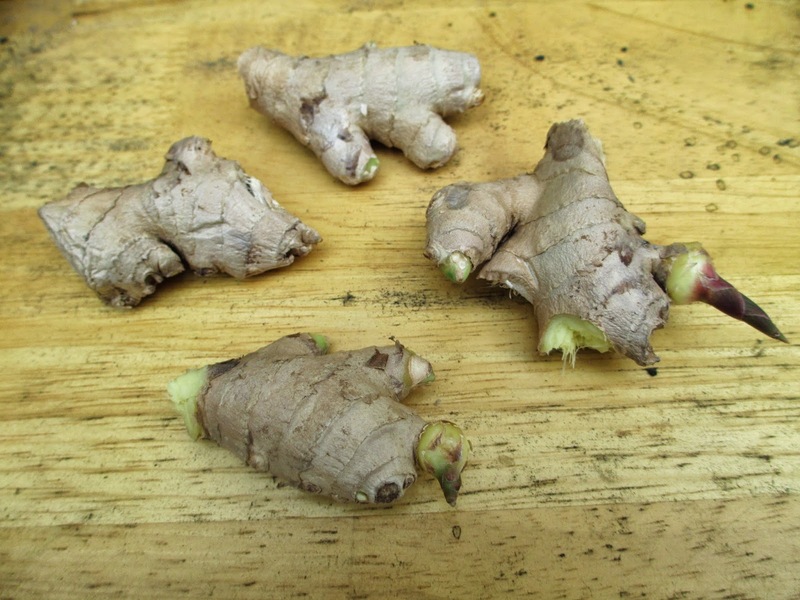 Break apart the ginger into 1-2 inch pieces, each with growth buds. After you break it apart, leave the pieces exposed to the air for at least one day. This allows the cut ends to harden so they won't rot. Planting depth is something that I've found varies by author. Some say to plant no deeper than one inch, some say to plant the rhizomes 3-5 inches deep. I decided to plant mine 2 inches deep. I spaced the pieces 4-5 inches apart in a clump. The rhizomes will develop and spread out to create a clump. Apparently they do not mind being a bit crowded so I decided to grow one clump instead of spreading the pieces out more. Being my first experience, I'm looking at this as a bit of an experiment. Maybe I will regret planting them so close together. I've also read that the rhizomes may even push toward the surface of the soil and become exposed which is said to be no problem. The foliage grows to 4 ft high and will die back in all zones except zone 10. Since I live in zone 10, I'm hoping for green leaves all year, but we will just have to wait to see. It takes several months for the roots to grow enough to be harvested. It can be harvested all at once in late summer/early fall once the leaves have turned brown. Simply dig up the clump, remove the foliage, rinse then dry the rhizomes. As you harvest the clump, you can simply break apart some of the fingers and replant them to grow your next crop. If you are like me, waiting nearly a year to harvest the mature roots will be difficult. The young rhizomes can also be harvested before then if you gently remove some smaller outer pieces without disturbing the plant. These younger parts are less potent, with a more delicate flavor than the fully mature root. I'm hoping for good ginger growing karma in my little garden!